The NIGHT HUNTRESS series is an urban fantasy romance featuring half-vampire heroine Cat Crawfield. Jeaniene’s heroine and hero have a difficult road ahead of them and they will have to work very hard to earn their HEA (happily-ever-after), so their story isn’t over with the first book. Currently there are seven Cat and Bones books under contract. At this time, Jeaniene is planning to end their story at seven (but C&B may talk her out of that). Cat and Bones appear as side characters in the spin off novels FIRST DROP OF CRIMSON (Feb 2010) and ETERNAL KISS OF DARKNESS (August 2010), plus have a short story featuring them as main characters in the DEATH’S EXCELLENT VACATION anthology (August 2010). So you’ll still get peeks at what’s going on in their lives before their next full-length book. HALFWAY TO THE GRAVE, Book One, Night Huntress series. Click HERE to learn more. ONE FOOT IN THE GRAVE, Book Two, Night Huntress series. Click HERE to learn more. 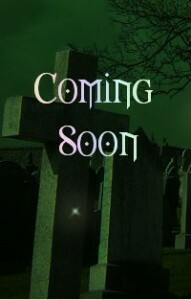 AT GRAVE’S END, Book Three, Night Huntress series. Click HERE to learn more. DESTINED FOR AN EARLY GRAVE, Book Four, Night Huntress series. Click HERE to learn more. THIS SIDE OF THE GRAVE, Book Five, Night Huntress series. Release date February 22nd, 2011. Click HERE to learn more. Cat and Bones, Book Six, Night Huntress series. Title and release date pending. Cat and Bones, Book Seven, Night Huntress series. Title and release date pending.